GSMArena team, 22 November 2017. The Oppo F5 runs ColorOS 3.2, based on Android 7.1.1 Nougat. Oppo's own UI team has never really been subtle about its aspirations and "creative inspiration" in the face of Apple and iOS. A little while back ColorOS 3.1 really took this to almost lawsuit-worthy levels and things are no different with the fresh new 3.2 release. To be fair though, styling aside, Oppo has been introducing interesting new features in its ROM, like WeChat payments via fingerprints, a dedicated night mode, and more refined UX. The level of customization runs deep within the ROM, making it far off from the standard Google-developed mobile experience. Units sold outside of China still come with the full Google suite, which has resulted in having a few apps with similar functionality - one by Oppo, and another one by Google. As already mentioned, the user interface is heavily iOS-inspired. There's no app drawer on the default launcher. Instead, every app you install gets dumped onto the homescreen. The Oppo F5 relies entirely on on-screen navigation. You can rearrange those, as you see fit. Once you set up the fingerprint reader, you might not be seeing much of the lock screen anyway. Unlike some previous Oppo implementations, this time the back-mounted reader is always on. It is also blazing fast and very reliable. It can secure more than the lockscreen - the phone can encrypt individual files or even whole apps, and make them accessible only with the correct fingerprint (or a Pattern lock as a fallback). But using fingerprints is so 2016. And since we are copying Apple anyway, enter Face Unlock. Or rather, dust off and revitalize an old Android feature that never quite worked right and was thus pushed to the side. However, this is about as far as the bashing should go regarding Oppo's Face Unlock. 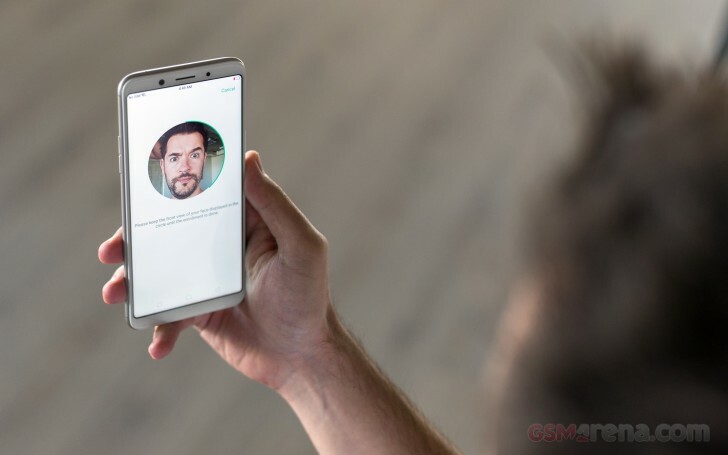 Not only do we have no doubt that every smaller Android manufacturer and their aunt will be trying to implement similar solutions in a month or so, but Oppo's works surprisingly well. It only works with a picture of your face, instead of a complicated 3d mesh, but is actually pretty reliable and managed to work regardless of hats, glasses and other accessories. It even copes well enough in a dimly lit room. You do need to press the power button for the selfie cam to start looking. It is not the fastest system we have seen either, taking around 300 ms in good light and 800 ms in dark environments to unlock, according to the manufacturer. Still, subjectively, the whole process only takes a split second. You get to catch a glimpse of your lockscreen and disillusion any iPhone X wielding bystanders at least a little bit. The wallpaper on the homescreen doesn't change like the lockscreen wallpaper does, but you can still spruce up the place with Themes. The Theme Store features whole themes and just wallpapers, sorted into categories (including free and paid ones). Themes change the icon pack, the lockscreen wallpaper, and even the system font. The notification shade features only notifications and nothing else. In what we can only perceive as a poor effort to copy iOS, ColorOS opted out of the simple and natural swipe right to dismiss gesture. Instead notification can only be swiped left to reveal a pair of button, one of which is delete. Nuisances aside, you do get a few options for the status and notification bars to play around with. Also, ColorOS has a pretty in-depth notification permission and management system that differentiates notification areas and goes all the way down to a per-app level. You can also set-up Quiet Time for notifications and calls. There is a full on auto power on and off scheduler as well, but oddly enough, it is in a whole separate menu, called Additional Features. This is far from the only instance of scattered and disorderly settings in ColorOS. But more on that in a bit. The toggles, brightness bar, music controls, Oppo Quick Share, and various app shortcuts are all placed in a Control Center-like second shade, which you pull up from the bottom. Yes, it's like iOS through and through. Unlike iOS, though, you do get some rearrangement and customization options from Oppo's Control Center. Still, the whole setup is highly unintuitive to most Android users. ColorOS is pretty big on the management side of things as a whole. Besides notifications, you can also manage some interesting permissions, like which apps get to spawn floating windows and paint over the rest of the UI. There is also a clone apps feature, but only a handful of messengers are supported. The same goes for game acceleration, which detects what it deems as games on its own, with no possible way for external control. These are surprisingly customizable as well. So, if you have the muscle memory for it, some pretty impressive setups are possible. There is a Phone Manager quite similar to what Huawei and Xiaomi have with the same name. It handles memory cleaner functions, app permissions and encryption, and virus scan, among other things. Most of these are shortcuts to the respective features within settings. And while we applaud Oppo for at least trying to bring some order in its menu chaos, it hasn't really done a good job. For instance, the privacy and permissions section of the app is missing quite a few entries from the respective Security settings menu. An odd organizational choice for sure. 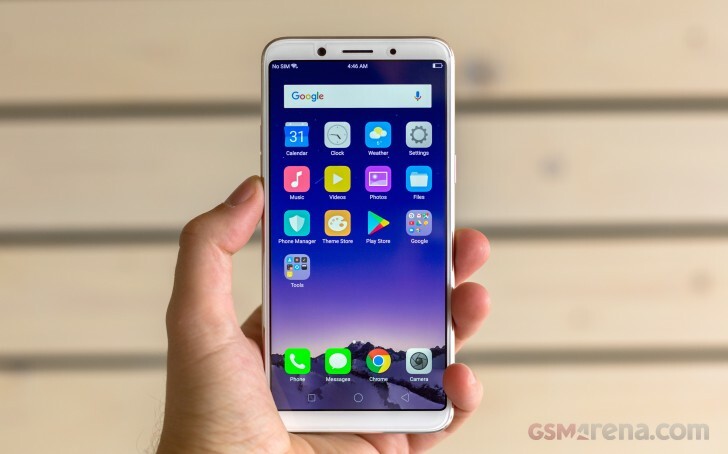 Some of these include a nifty dedicated Kid space, complete with an app whitelist, cellular toggle and even a duration timer for when you want to utilize the Oppo F5 as a digital pacifier. There is also permanent call and message blocking (separate from the quiet time one) and even a system to protect from known pseudo base stations. First time we've seen such a thing, but it sounds good. Interestingly enough, there are no battery and energy saving settings in the Phone Manager either. You have to go into the Battery section in the main settings menu for those. Other than not being convenient to reach, these are actually pretty nifty. You can toggle a power saver mode from here, but also dive into individual apps and allow, disallow or limit their respective background activities. For the most part, ColorOS manages these intelligently enough so as not to kill your IM, but it is still a good idea to double check for some less popular or critical apps, since by default, most background activity gets axed. Last, but not least, ColorOS 3.2 has split screen support. Unfortunately, it only works with a relatively small number of apps. When it does work, though, it is pretty functional.